Dobes are not picky eaters and will happily eat their own food and anything else that finds its way into his mouth. 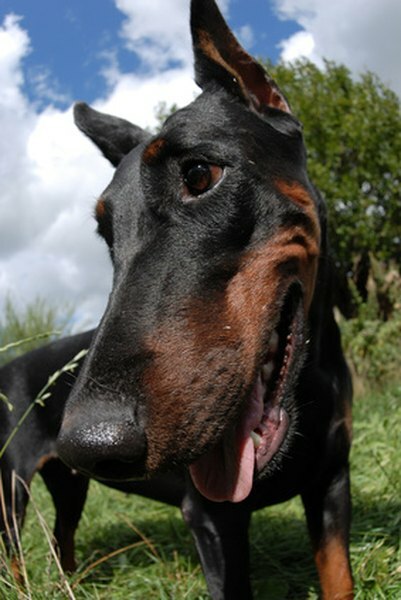 A well-balanced and regulated diet will have your dobe's coat shining, his body functioning at optimal levels and his love for you available for many years to come. Allow puppies to nurse from their mother's teat for six to eight weeks. After six weeks, alternate between small portions of canned meat and nursing sessions. Your dobe pup should be weaned by the eighth week. Choose a high-quality dog food. The first ingredient should be some form of meat, not a grain product. Grain-based foods cause flatulence. A doberman puppy or dog that get average physical activity should have 26 percent protein and between 15 to 18 percent fat content, according to the British Columbia Doberman Pinscher Club. If your dog is fed a quality dry food, no additional supplements are required. Decide between dry and canned. Dry is less expensive and contains the least amount of fat, but is full of preservatives. Canned foods are more expensive and up to 70 percent water, according to “Doberman Pinscher” author Lou-Ann Cloidt. Avoid semi-moist foods since these are full of sugar. Change food based on the dobe's three stages of life. Puppy food has higher calories since the dobe puppy uses so much energy during the first year's rapid growth period. Your dobe is fully mature at 12 months and can be switched to adult food unless your dobe's veterinarian recommends puppy food for a longer duration. Seniors have slowed metabolism and digestion problems, so a senior blend of food is more compatible for the doberman over 10 years old. Create a feeding schedule. A 6- to 8-week-old dobe eats three times per day, but after eight weeks, the puppy eats twice per day: morning and evening. This feeding schedule continues throughout adulthood. An elderly dobe finds smaller portions easiest to digest, according to Cloidt. Ask your dobe's veterinarian the amount of each serving or follow feeding guidelines on the packaging. Provide fresh water with every meal. Dobes enjoy variety in their diet, but changing foods too frequently leads to digestive problems. Adding flavored stock gives the food different taste, according to Cloidt. Consult with your dog's veterinarian to determine if a vitamin or mineral deficiency is present. The veterinarian can prescribe vitamins and minerals, according to the Gentle Doberman. Have your doberman sit in front of his full food dish until you give him the OK to eat. Too many vitamins and minerals, especially calcium, can be harmful to a doberman, according to the Gentle Doberman. A doberman vomiting yellow bile is a sign of hunger, according to the British Columbia Doberman Pischer Club. Open packages of dry dog food lose their vitamin value within 90 days of being opened, according to Cloidt.